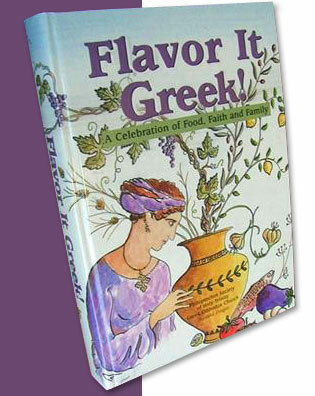 Second printing of Flavor it Greek! and now, Fun with Filo! The Greek community of Portland has collected 300 of its time-honored recipes and put them into a cookbook: Flavor It Greek! A Celebration of Food, Faith and Family, now in its second edition (March 2005). Published by the Philoptochos Society of Holy Trinity Greek Orthodox Church, the 352-page hardbound book includes recipes for everything from spinach pie (spanakopita) to cookie twists (koulourakia), meatballs (keftethes), Easter bread (tsourekia) and roasted vegetables (briami), as well as an ingredient list so you can make enough baklava to feed a festival of 10,000. The book was produced with the help of 100 volunteers and 96 financial donors. All proceeds from the sale of "Flavor It Greek! A Celebration of Food, Faith and Family" support charitable projects of Portland, Oregon's Philoptochos Society. In addition to recipes for appetizers, pita, pasta, pilaf, and poultry, the book also includes recipes from several local restaurants. The book features 78 Lenten dishes prepared without dairy or meat products, Greek translations for all recipe titles, personal notes from each contributor, and a special section on faith and tradition. We also offer a Flavor it Greek! apron and a coordinating towel. You may purchase these online or at many stores in the Pacific Northwest. Flavor it Greek! is the recipient of the Oxmoor House National Award, "America's Best Recipes" Edition 2003, 2002; the National Tabasco Award, Regional Winner 2000; 1st Place National Philoptochos fundraising Project of the Year 2000; and is included in "Best of the Best from Oregon: Selected Recipes from Oregon's Favorite Cookbooks." Proceeds from Flavor It Greek! products have funded nearly $50,000 of services for women and children in the greater Portland area. Recipients include Holy Trinity Community Assistance Fund; Kids 'n' Cancer - Camp Agape; New Avenues for Youth, SIDS Resources of Oregon; William Walker Elementary School Special Needs Fund; Grout Elementary School; Assistance League - Children's Dental Center; North Portland Nurse Practitioner Clinic; Centennial School Teen Parent Program; Hope Dolls; Raphael House; Insights Teen Parent Program; Columbia River Girl Scouts Council - Beyond Bars Program; Candlelighter Parent's Emergency Fund from Camp Agape; and OHSU Foundation - Breast Health Education. We thank you for your continued support of Philoptochos. Copyright © 2010-2016 The Philoptochos Society of Holy Trinity Greek Orthodox Church in Portland, Oregon.